To ensure peace between her tribe and their savage conquerors, the exquisite Bronwen has been promised in wedlock to a high-born Roman tribune. But the British beauty is also a secret spy ready to risk her life to free her people. Dispatched to Britain by Mark Antony, Claudius is irresistibly drawn to the flaxen-haired, cobalt-eyed Bronwen. Yet he knows he dare not trust the woman who is bound to him by law—not love. I enjoyed this story a lot. The characters were excellently portrayed and I felt for each and every one of them. I was rooting for Bronwen and Claudius throughout the tale and was happy when it was clear they would achieve their HEA. I also liked the sub-romance between Brettix and Lucia and would have liked to read more about them. It works out good though. The ending was a bit lackluster and abrupt for me. I wanted more, I wasn't ready to say goodbye to any of these characters! That said, I had some issues with the huge amount of typos and the inconsistent pacing. Neither were bad enough to pull me from the story, but they were annoying at times. Although, some of the typos did lend some comic relief to an otherwise serious tale, like the heroine taking her own lips in a passionate kiss or kissing her own eyelids… That's just a couple examples of the many errors and I'm quite surprised proofreaders/editors/someone didn't catch them. That's the reason for a lower mark from me. 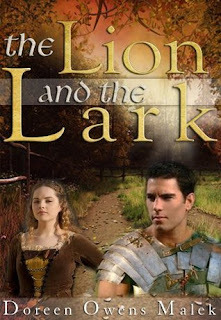 THE LION AND THE LARK is a great story though and I highly recommend it to romance readers that love early history as well. When Claudius and Bronwen finally consummated their marriage after what seemed like forever and wondering if they would ever be able to overcome their differences… Very emotional and moving.